BMW are branching out. As well as the quirky boxers and brutish inline fours we've got used to recently, they've recently gone into the world of parallel twins with their new F800S. In the spirit of impartiality we got two of our writers - Jocke Selin and Clare Gamby - to have a go and give us the benefit of their rather different perspectives. Being an old fashioned sort of chap at heart, it's ladies first. As you’ve probably noticed by now, I’m not one of the usual suspects when it comes to doing bike reviews (hey, I leave that to the experts! ), but on this occasion I just had to put something down on paper. Well screen I guess. Those who know me know that I ride bikes for the simplest of reasons – pure pleasure. I don’t know all the technical bits and pieces nor do I want to. All I want to know is does it press the right buttons for me and how big is the grin factor? Simple really. Bearing that in mind, I’ll happily jump on to any two-wheeled beastie – big or small - and try it out. Very rarely do I have preconceived ideas about any bike brand or model, which has served me well over the years. Except for Ducati and boy was I wrong there! In a good way, honest. But that’s another story. Anyhow. BMW. Hmm. By default, I tend to associate BMW with four wheels, not two (almost certainly because I have the four wheeled variety as my other mode of transport). So I was having a bit of an attitude adjustment as I headed off to our friendly local BMW dealership in Oxford. But hey, it was a launch day and I’m always curious about anything new on the market. After a bigger delay than hoped – oh the joys of putting my own bike through its service! – we made it there just as they were wheeling the bikes back in to their beds for the night. Arse. No chance of having much more than a quick look over the main attraction for me: the new F800S. In appearance terms, first impressions told me that it most certainly is a BMW but I have to say that it looked like it had an air of cheekiness about it. I was intrigued. 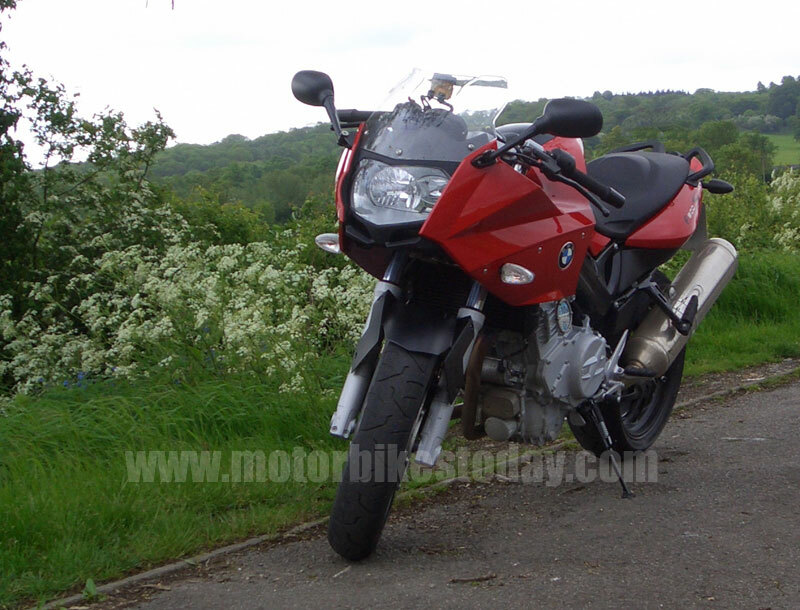 In fact, intrigued enough to book a test ride for the following Saturday. Ho hum, a week to wait then. In the meantime, I had a nose through the obligatory glossy brochure. You know the sort. Big evocative lifestyle shots and no more than five words to a page? Very informative – apparently. I’m sure it will look great on a coffee table somewhere. So here we are it’s Saturday morning at last. Ooh yummy. Just looked out the window and the weather is what can best be described as interesting. Blowing a gale but not raining – yet. By the look of the clouds I decide it’s only a matter of time as I shuffle into my Gore-Tex and head off. Pulling in to North Oxford garage, I’m a little disappointed to note that the little fellow is nowhere to be seen. 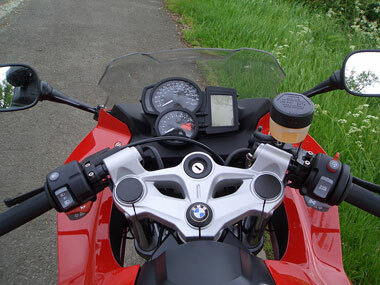 No matter though as by the time I’ve had my complimentary warm-up coffee, the F800S turns up. That’ll be Jocke then. Not wishing to push him out of the way entirely unceremoniously, we exchanged a few comments about the bike and I got shown the once over on the controls by Phil, the Sales Manager. Time to set off. 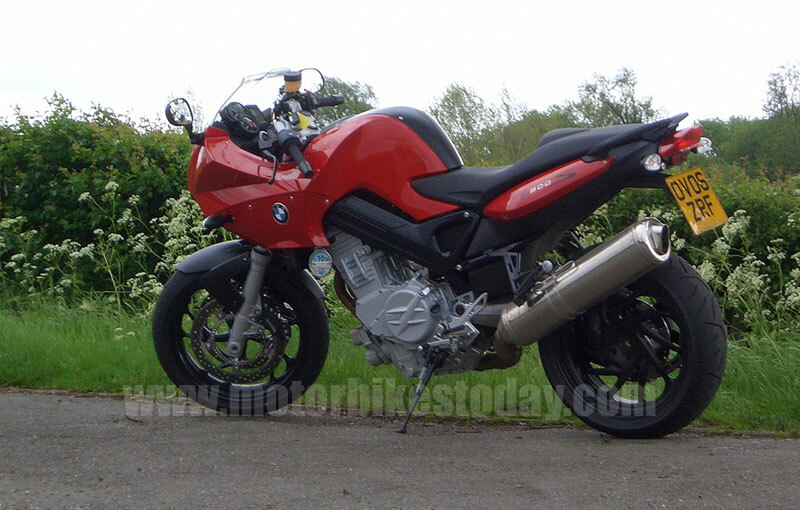 On tick over did the F800S have a throaty grumble? Hmm. More like a slightly agricultural bit of phlegm. But I won’t hold that against it and I’m sure there are more than a few Buell owners out there who would recognise a hint of familiarity at the sound and maybe even smile fondly. Twisting the throttle, the tone tightened in pitch and purpose and I was heading off down the back roads. 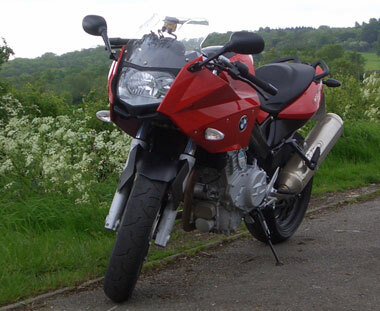 Very quickly it became apparent to me just how user-friendly the F800S is, dipping delightfully into and out of corners and roundabouts and when you put the power down, reacting like an ever-so-slightly ecstatic – but well-trained - red setter welcoming a returning owner. With a fairly upright position (don’t forget I normally have to fold myself origami-style onto my GSXR750), the ride was wonderfully comfortable and I could quite easily imagine setting out for a blast on a sunny summer morning only to get mildly confused when what would seem like minutes later the sun would be setting and visibility through my tinted visor would be getting a little difficult. Not a bad dilemma to find oneself in though on consideration. As the miles went by, I kept wondering why I was running out of oomph (note the use of a technical word there! I’ve read the books, I know what I’m talking about!). Ah, that’ll be me topping out through the gears then. This twin made me want to ride it absolutely pinned on the throttle, which I later found out was the preferred approach of the BMW team when they first got to test ride a bunch of them at Donington. In fact, Phil did say that given the choice between the F800S and the other bikes on offer, for a blast around the track 9 out of 10 people were opting for the F800S purely for the grin factor. As my first proper bike was a twin, I can totally relate to that and this one did not disappoint me either, particularly when the weather decided to take a turn for the worst. In the rain my own bike can be a little sensitive, skittish even, such that caution tends to override the fun factor somewhat. So it was an absolute pleasure to be bowling along the winding country roads on the BMW as the rain lashed down and feel how planted the wheels felt and neither notice or care about how wet the roads and I were getting. In fact, I was rather miffed when I realised it was time to turn around and head back. Somewhat reluctantly, I handed the keys back. It must have shown on my face how much fun I’d had as I soon find myself talking through with Phil what options I would have on it if I bought one. Would I? If I could afford to run two bikes, then absolutely no question. So what were my yardsticks for this test ride? Grin factor and button pressing if I remember correctly. Well, if we briefly go literal and put aside the slightly eccentric (to me anyway) indicator switch set up that BMW seem to prefer and a not-as-smooth-as-I’d-like gearbox, the F800S most certainly did press the right buttons for me. I can only describe my behaviour as hooning. Oh and giggling. A lot. Which I guess covers off the grin factor too. If you’re in the market for a ride all day, go anywhere, torquey little number, then you really should check out the F800S. In my opinion it really does beat any other comparative model out there. A while back it seemed to me that BMW had their model lineup all figured out a long time ago. That they had kind of reached a maturity stage and didn't "need" to introduce new models, but the steadily kept on working on what they had. I should have known better. 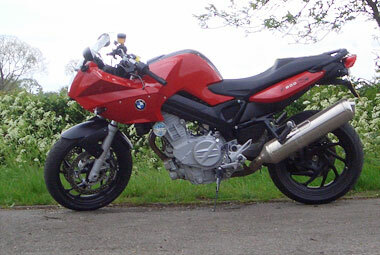 The first sign of radical change was the introduction of the K1200S. But still at that point, little did I see that there actually was a gaping hole between the F650 models and the 1200cc models. We all should have been able to anticipate that something was going to fill that gap. When BMW announced the F800S it was clear, and it made perfect sense. A middleweight model series that would fit ideally as a first or second bike (sure it will suit anyone who doesn't crave massive power, but more about that in a bit). The bike they have introduced is actually quite a peach. It's got an 800cc parallel twin that produces 85 bhp in an 182 kg (dry) chassis. That means that the bike isn't a racer but it'll hang off the cruisers for sure. Unlike the "big" BMWs the F800 series comes with "traditional" telescopic forks, just like the F650 series. And just like the F650 Scarver the F800 series has got a belt drive instead of a chain or shaft drive. Naturally most of the usual BMW goodies are available for a "nominal" (cough) fee. I think this bike is quite a good looking one, it's not art but a good looking bike. The parts that strike me the most is the beautifully sculpted swing arm, the very nice way the engine has been left exposed under the frame and somehow, the top fairing looks kind of business. The wheels have got the same sporty styling as the K1200S with swept spokes. The controls and instrumentation are familiar to anyone who's ridden BMWs before, which I think might be a bit of a miss from BMWs part, especially as the bike is angled into a market segment that's new for BMW. These potential new riders aren't accustomed to BMW's special controls. What I'm especially thinking of is the indicator system that requires you to first activate the indicator on the side you're turning to, and then cancel with your right thumb. I would much rather have seen traditional switchgear that everyone is familiar with. Luckily the quirkyness hasn't transpired to the instruments as they are, as per BMW, very clear and concise. On the top you have a speedometer, and just below the rev counter, to the right of both of them you have a big LCD display that gives you a lot of information. One useful piece of information is the gear indicator; you won't have to look for that 7th ghost gear anymore. In the old days, parallel twins have been known as the suicidal engine layout due to their tendency to simply vibrate themselves to death. I'm glad to say that time has moved on progress can clearly be both heard and felt in this new engine. Sure you can feel that it's a twin, and even that it's a parallel twin, but it does not have any suicidal tendencies. The beauty with a parallel twin is the extremely compact layout along with the relatively cheap manufacturing costs (only one cylinder head for example). Give the engine a bit of revs in neutral and and even the most mechanically sympathetic persons out there will keep their heart intact. Out on the roads the bike is completely unintimidating, it's stable and secure. The power is there, but not in anyway in a scary way. It's got plenty of torque to rescue even the doziest rider out of any "oops-I-forgot-to-change-gear"-situation. This is a very relaxing bike to ride; it really compliments you as a rider and I think that's very important in a segment like this. If you want a bucking bronco, go buy a ZX-10 instead. Thanks to the belt drive, you've got instant drive without any of the negative aspects of a chain drive or even a shaft drive. The chain tends to be noisy and clunky with a variable level of slack. Not to mention messy. The shaft drive is heavy and eats into your power, but it also has got a tendency to raise and lower the bike under acceleration and deceleration. The belt drive is quiet, tight and clean. With a service interval of 20,000 miles you shouldn't have much to worry about. The suspension adds to the package by being firm but not too sporty, normal road riding is just perfect. Nasty bumps are soaked up nicely, whilst still avoiding a spongy feeling. It's a bit sad that BMW didn't use one of their excellent front suspension set-ups as I think that would have added to the secure feeling of the bike. A bike in this class that didn't dive under braking would surely have inspired a lot of potential new business. But don't fret, the telescopic forks are well up for the job. Another part of the bike that soothes the rider is the brakes, good feel and plenty of stopping power; business as usual for a BMW bike. It's nice to see that no corners have been cut; two 320mm brakes with 4pot brembo calipers operated by steel braided hoses. It can't get much better than that. Or can it? The ABS system is an optional extra, and still very few new BMWs leave the factory without ABS. 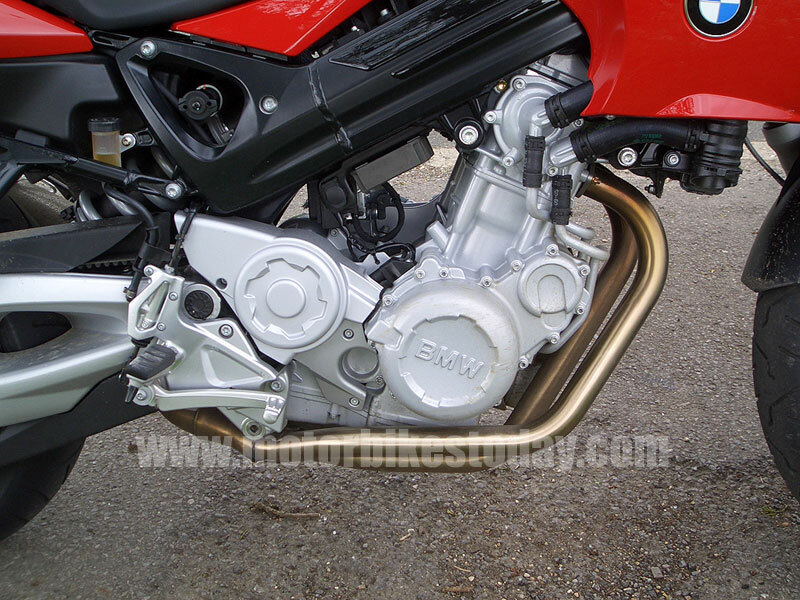 Just like the newly released R1200S the F800S has also got a new version of the ABS system. This new system only adds 1.5kg of weight to the bike, which is quite remarkable as it involves pumps, hoses and electrics. with a smile on my face, and the bike was stable and sure-footed. It held the line just beautifully and made me a much better rider than I am. It gave me the chance to let my riding come out of me naturally without any brute force or aggression. It left me with a content smile on my face. I could have ridden this bike day in and day out without getting bored. You can really make this bike your own BMW. Considering that this bike's price starts from £5,999 you get quite a lot of bike despite being quite a bit more expensive than, for example, a japanese alternative in the same league. Add to that the 6,000 mile service intervals and you're already starting to see that your initial investment might actually go somewhere. Another point to remember is that when it comes time to trade the bike in, BMWs have traditionally held their value quite well. There's a good chance that the dealer will offer you more than a good laugh when the time comes. For a first attempt at a bike that's supposed to fill the gap between the F650 range and the 1200cc bikes I think BMW has done an excellent job. This bike is absolutely perfect for someone who's been riding for a while and doesn't feel that 100+bhp is necessary. Maybe someone who's moving up from a 650cc V-twin, or maybe one of the very popular 600cc inline fours, such as the Bandit, Hornet or Fazer. 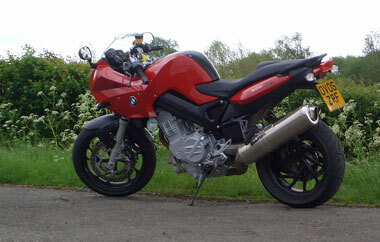 Or why not as a second bike to your Super Bike, this one you could use in all weather, use the BMW luggage, enjoy the heated grips and so forth. A bike you could really use, regardless of who you are. If you're even a bit curious, I'd recommend you to pop your head into a BMW garage and take a look, and why not ask to take the bike out for a spin. I'm sure you won't be disappointed. 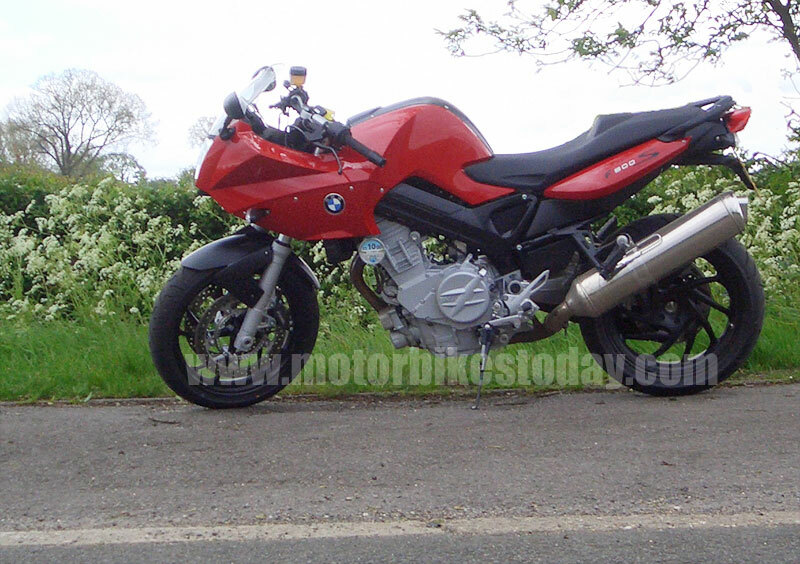 Read external BMW F800S reviews on Ciao.